When I was rooting around earlier I did notice that the director control platform was fitted to various other Grand Fleet ships beneath their foretops in a similar way as to Invincible. It would nake sense that ships with a similar mast configurations would have had equally similar director platform installations fitted by the shipyards when they were refitted, I can't believe they would have all been designed individually from scratch. More probably there was a common basic design which was modified as needed to fit individual ships. Therefore it is probably worth looking at photos of other ships in the early wartime years to see if there are common elements to the platforms which might give a clue about the access arrangements. As originally designed, I believe the capital ships had internal ladders running up the tripod trailing legs which terminated in the foretop, The director platform was a subsequent addition so Akira may well have a point that a vertical external ladder might have been provided down from the foretop. Further to my post above I have now noticed that HMS Canada had a similar arrangement. You can click on any part of it to enlarge and it clearly shows a vertical ladder extending from the top of the bridge up into the director platform. As you may bea ware, there is a builder's model of HMS Canada which featured in the recent Jutland exhibition at Portsmouth Dockyard having been restored for th occasion. Interesting reads and of course very helpful pictures. Unfortunately Geoff I’m not sure either but if I find anything substantial I’ll share the information. I’ve just restarted my build trying to catch up, finishing off the quarter deck planking before completing the gun turrets. I’m remaking my funnels simply because I liked your method better, the vacform items don’t quite have the crispness I want. 1) I agree similar ships would probably have had similar arrangements but care needs to be taken as the legs on some tripods stopped short of the spotting top and access was through the legs - Anatomy of the ship Dreadnought shows this clearly. Invincible, and others had legs which extended up to the spotting top. Going through my books shed no light as predictably the shots are all taken at the wrong angle. 2) On the Sambrook plans that I have they have been right in everything so far. There is a plan of the later spotting top which shows clearly three manholes. One central for the main leg and two aft. These are for the ladders on the outside of the legs which then clearly go vertical to the spotting top. 3) However it clearly shows there are no other manhole covers so this suggests ladders going down to the director were not there. The distance between the outside ladders and the director platform is just too far and if that was the access route why not just extend the directot platform a little further aft to meet the ladders - they did not because they did not need to as obviously there was another route. 4) One anomaly with the director platform plan is that it is linked to the two legs to about 50% of their diameter so it overlaps each side with the width to take a man. My initial thoughts were that this was to secure support (correct for sure) but I can't see any value in having it wider unless there were doors cut in the legs. The problem with this theory is that if there were ladders inside the legs why have them outside as well and why are there no manholes over the legs in the spotting top so that doesn't really make sense. 5) My conclusion is that as there was a ladder inside the main leg and it reaches the spotting top it would have been very simple and logical to cut another door to facilitate access to the director platform. This would all make sense and fit the photigraphs of no clear access route as its just not visible. 6) Rotating the director would then give outside access to the platform for maintenance work unless sliding doors were fitted which would just give room to squeeze out. I will continue to do some research but at the moment I think the central leg nust have been fitted with a sliding door. Another area of research is to find plans of the director itself which may show an access door. Rememeber the director was able to rotate about 300 degrees. That all sounds pretty logical and it's very unlikely that anyone would be able to prove differently. The outside ladders were probably used for maintenance purposes or in connection with renewing/replacing rigging etc. Knowing what the military is like, I’m thinking that would have used anything that was pre-existing as a basis and then added to it, however that is from a modern perspective as the budget today is vastly different to 1914/15. Logically there are only a limited amount of solutions to the problem either external ladders or doors accessed from the mast centre pole are the most obvious ones. Looking at my photos if my Dreadnought build representing her in 1916 after her last major refit I used the anatomy of the ship book to build this area and it was difficult to work out how they gained access to the structure around the director (it had hand rails around it too) but didn’t clearly show a hatch on the director itself. The main access into the director on Dreadnought was via the old manholes into the base of the director. I haven’t got access to my plans since I’m at work at the moment so I can’t remember if there is an internal ladder on the Invincible but it’s a shame that pictures of this critical area are in short supply as I would love to see what was going on up there. As always if I find anything out I’ll let you know. Just spent this afternoon having a good study of the original plans in John Roberts’s British Battlecruisers. The ladder marked in blue which runs up the length of the foremast centre pole appears to be an internal ladder not external as the one running up the LH and RH supporting poles. I’m guessing from the layout control platform in relation to the former searchlight platform that to gain access to the searchlight platform is from the vertical ladder from the control platform above. It appears to me that you can climb the internal ladder inside the mast to the control platform entering it via a manhole then down an external ladder on to the roof of the director on the redesigned searchlight platform. Yes, I would agree Nick. The ladder down looks like a rope ladder. Maybe they made it a metal ladder when the searchlight platform was adapted for the director. The issue I have after looking at one of the few full views of Invincible in 1914 is the modified control platform. It's extended forward so the use of an external rope ladder might not be possible however since there doesn't seem to be any clear drawing showing the modelifications made to the control platform there may be a manhole over this position leading down to a roof access hatch into the director. 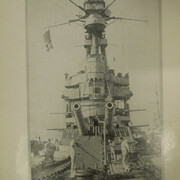 The ship's drawings in the pre-mentioned book by J Roberts shows a strange extension from the director into the foremast central pole but looking at the attached picture of Invincible at the Battle of the Falkland Islands there is clearly a large-ish gap between the director and the foremast. I still guess that the main access was via a roof access hatch after climbing down a rope ladder which seems very, very scary in times of battle if you wanted to enter or escape the director. It appears, from plans of her 1914 rig, the the platform in question was extended aft enough to allow access to it from the external ladders extending up the aft legs of the mast. But on a similar vessel, HMS New Zealand, the director is fitted in a similar position, I've attached this picture incase you can see anything that I can't. Done a bit more planking on the quarterdeck, hopefully the planking will be finished next weekend. Firstly thank you all for the feedback which is very much appreciated. It is this sort of assistance that maked MBM such a good site. - The plan indeed does show a ladder (rope ladder) comming down from the foretop however this is to the searchlight platform which was later removed for the director platform which was larger. The director platform was also lower down. At the same time the foretop was extended forwards to make room for additional fire control instruments. The Sambrook plans show that there was no manhole cover at this point - indeed this would be directly underneath the rangefinder stand and the angle down would not permit any other type of ladder. - Fire control crew were a specialist division and they may not have been agile enough to climb such ladders 100 feet above deck, particularly in a storm or in action. - The original plans show a ladder in the main strut so I suspect this was the prefered route to the fortop (and the director top). The ladders on the outside would have been reseve access routes. Curiously with Dreadnought they also contained internal ladders but crucialy the legs stopped short of the foretop so this was possible. - The legs on Invincible's tripods almost disapear at the top so it would have been hard to secure access with internal ladders. We need to reflect that at the time this was all cutting edge technology so they were trying out subtley different solutions in different ships. - I generally concur with the KISS principle as well so logic would suggest it would have been easy to cut a door in the central leg particualrly as they could also strengthen the surround at the same time. - The gap between the director and tripod is very small such that there would not appear to be room for a door to open so if sliding doors were used this would facilitate access. A door would be necessary as if just an opening when steaming at speed 26 knots ionto a 10 knot wind you would get a blast of air down the leg at 36 knots! - One further curiosity is the design of the director itself as the top part was free to rotate which would inturn mean access would be through a short door, or the roof but there are no ladders for access. My ussunmption would therfore be there would have been a crawl door in the lower fixed part of the director for access. - There is another mystery as well as I seem to recall reading the book Invincible by Tarrant that during the Falklands action an 8.2" shell detonated in the left strut leg and the blast went up knocking the officer in the spotting top over no damage but he missed the fall of Invincible's shot! Now this would suggest there was a way up the legs unless he means where the legs joined there was a gap so blast could dhoot up! I don't think we are going to find a definitive answer but I doubt if there is anybody arround who can say "that bits's wrong!". I've posted some updated pictures on "Invincible Too" for state of play as of Sunday. Thanks for the pictures, as they say, every little helps. The centre one that could be the manhole leading down to the director platform. See what you think. Good catch! Whilst I have these plans I had not noticed the additional manhole cover in the floor. This would certainly confirm an access route but I have never seen a picture which shows a ladder unless it was a rope ladder, which candidly would be challenging in a seaway at 25 knots into a 15 knot wind. I'll recheck what pictures I have now that I know there may be something there. I still tend to thnk a sliding door in the main strut would be the sensible route so maybe there was both, which would make sense. Not much further progress on my iInvincible. I have made and fitted lots of mushroom ventialtors to the edge of the hull. I have so much to do I'm not sure where to start but I may have a go at detailing the funnels. 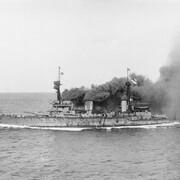 Hi Nick, remember reading an article some years ago about fitting gun director platforms on dreadnoughts, one note was that after a days steaming the hollow masts used to get so hot that the gunnery officer was unable to get down on the internal ladders in the tubes and his food etc was sent up on a hoist. Though I think this was on the ones where the directors were fitted some time after build as they put on the foremast over or just behind the funnel. I seem to rememeber you were looking for a picture of a cooling machine for Invincible. I have found a picture in a long lost and found book - Janes 1914. At the begining of these books a large number of manufacturers advertised their wares and some have pictures. It may not be specific but the adverts may be a good source of information. Thanks for the info, ironically I’m just starting in that area on my forward superstructure build, just working out the searchlight platform behind the second funnel. I’m waiting for paint to dry as I’ve finished painting the corticene on the forward superstructure coaling winch deck. Hopefully some pictures soon as soon as I’ve made progress.